This was taken during a brisk afternoon just outside of The Pantheon in Rome. We have discovered that traveling to popular locations during off season has many advantages such as cheaper airfare, abundant accommodations and for a Photographer, fewer Tourists! Some locations are more suitable for this strategy than others – we wouldn’t recommend Greenland in the winter, but I do bet that it is cool (literally). During the peak summer days, this fountain would not only have its share of the”regular” avian friends but throngs of people hanging out and enjoying the magnificence which is Rome! Here we set up a small inconspicuous tripod called a Gorilla Pod from Joby and shot three exposures to grab as much light as possible during this flat light day. As a bonus, we caught two frames of a pigeon and its shadow coming home after a long day at work! To purchase a Digital Download or Print, just click on the image and you will go directly to our photography website where choices abound. We recently went to see The Dark Knight Rises and it struck us that we think we discovered where he is hiding out! It is in the farthest alcove of St. Johns in New York! The church was vacant except for a few visitors that weekday so was perfect for some amazing uncluttered compositions! Click on the Photo to order a Limited Edition Print! We all have days when we are faced with chores, errands, or responsibilities that we don’t want to do. At times like these, it’s easy to get into a bad mood and stay in one as we tackle these tasks. However, given the fact that our bad mood will not change the fact that we have to do these things, and will most likely make things worse, we could also try to shift our attitude. Many wise people have pointed out that it is not so much what we do as it is how we do it that makes the difference in our lives. It’s important when we’re facing something that’s really hard for us, whether it’s doing taxes, paying bills, or visiting a challenging relative, that we lovingly support ourselves through the process. The more supported we feel, the easier it is to open our minds to the idea that we could change our way of looking at the situation. In truth, most of the chores we don’t like doing are intimately intertwined with our blessings. When we remember this, we feel gratitude, which makes it hard to stay in a dark mood. We can shift our attitude by considering how much we love our home as we clean it and how lucky we are to have a roof over our head. Any task can be transformed from a burden to a necessary aspect of caring for something we love. All we have to do is shift our perspective, and our attitude follows shortly behind. This wonderful window scene was shot at The Prager Winery in Napa, California. Prager is a purveyor of some very fine Ports and the atmosphere in the testing room is just jubilant. This window has not been dusted for many years if not decades and has grown home to many a critter. The owner, Peter, mentioned that he considered this shot to be one of the best he has ever seen – this is a high compliment coming from someone who sees this every day! We were flattered beyond measure! We used a Manfrotto Tripod to stabilize the Nikon D90 (ISO200, f3.5, 1/8s) as the room was very dark and we did not want to ruin the subtle natural light coming from the cobwebby windows. 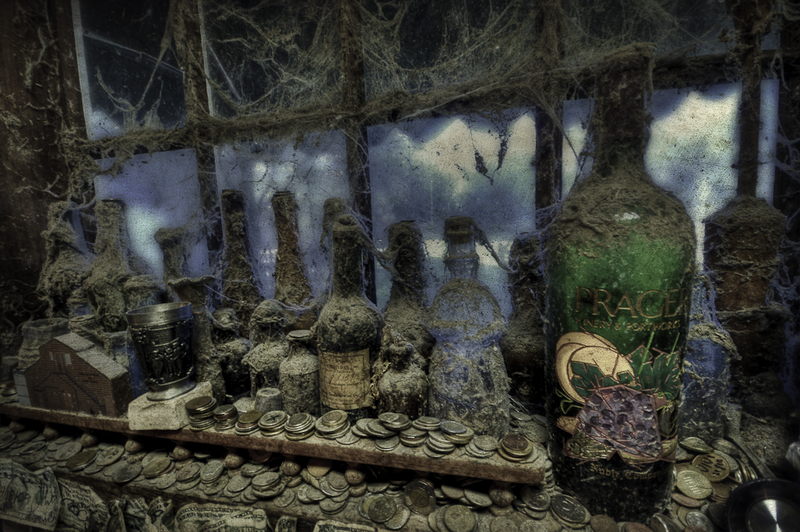 Someone recently mentioned that this reminded them of an old officer’s quarters in a Pirate vessel….what do you think? The very moment during the day when we very first open our eyes and come into consciousness is a precious opportunity. It sets the tone for all that comes after it, like the opening scene in a film or novel. At this moment, our ability to create the day is at its most powerful, and we can offer ourselves fully to the creative process by filling this moment with whatever inspires us most. It may be that we want to be more generous, or it may be that we want to be more open to beauty in our daily lives. Whatever the case, if we bring this vision into our minds at this very fertile moment, we empower it to be the guiding principle of our day. 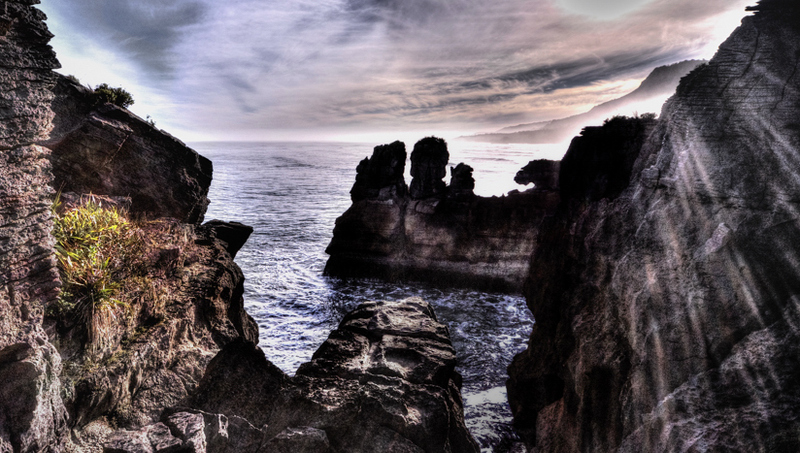 This vista was photographed first thing in the morning close to Punakaiki which is a small community on the West Coast of the South Island of New Zealand, between Westport and Greymouth. The community lies on the edge of the Paparoa National Park. The Pancake Rocks are a very popular tourist goal at Dolomite Point south of the main village. The Pancake Rocks are a heavily eroded limestone area where the sea bursts though a number of vertical blowholes during high tides. 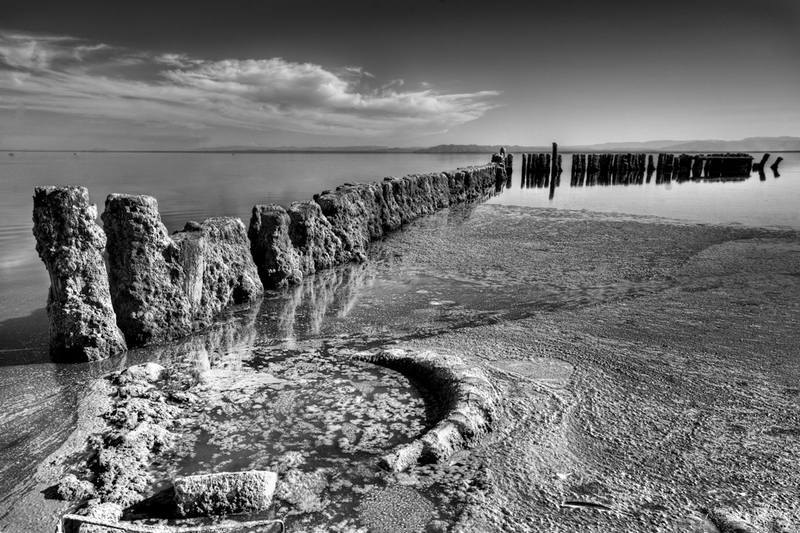 Together with the ‘pancake’-layering of the limestone (created by immense pressure on alternating hard and soft layers of marine creatures and plant sediments), these form the main attraction of the area. The picture was taken with a Nikon D90, tripod mounted…we deliberately shot into the rising morning sun to capture the striations of the sunlight on the rocks to the right as well as the tiny plant holding onto the rocky cliff on the left, bsking in the first light of the day. 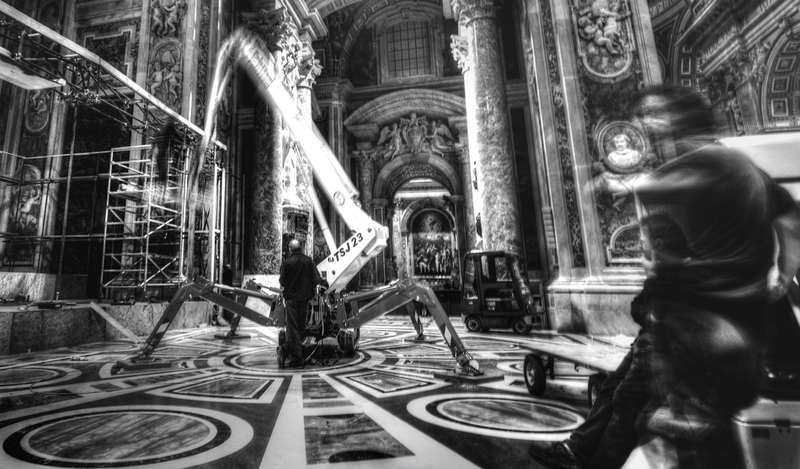 In the great symphony of life, we all have important parts to play, just like these repair workers inside The Vatican. When we do our tasks well, we infuse them with our unique energy, making each act a gift. Each of our personalities and talents are suited to different roles of support. Even leaders and star performers support others in their own way. We can look around us at any moment to see that while we nurture some people with our work, others are supporting us with their gifts. Doing any job from this place within us allows us to do our part with humility and gratitude, while also learning lessons that move us steadily toward our goals. We happened across this rather unusual scene during a visit to the Vatican in Rome. We were surprised to see this heavy machinery setup with the swing stage suspending a worker who was diligently making repairs to this beautiful edifice. Guess even “The Big Guy” needs a hand sometimes! Quietly sneaking up on the scene, we surprised the gentleman on the right (we assume he was the Boss due to his supervisory posture) and quickly composed and executed the shot. The motion blur was deliberate and lends a sense of life and action to the scene. The image was processed in Nikon Capture NX2 for White Balance correction, exported to Photomatix Pro as a NEFF, then final touch up in NX2. Shooting inside churches (or The Vatican for that matter) is tricky. If one is allowed to use a Tripod, then by all means, do so….these places are dark and slow shutter speeds with small apertures are inevitable unless one begins to push the ISO (or as we used to call it, Film Speed) to higher values (more and more grain). White Balance can also be set to Auto and then later corrected provided your shoot in RAW (NEFF for Nikon) and have the tools to correct in post processing. Though we may use a single set of characteristics to define ourselves, when we feel called to explore the way of the warrior, we may feel a strong sense of dismay because we have no wish to disavow ourselves of our softer side. Yet embracing the warrior spirit is not a matter of denying gentleness or compassion. We can exhibit strength without sacrificing tenderness precisely because both are elements of the self and both have a role to play in the complexity of existence. The warrior spirit, when allowed free rein, is overpowering and all-consuming. If it is to be an affirmative force in our lives, it must be tempered with wisdom and moderation. Our inner warriors are ready to react instantly to conflict, chaos, and confusion, while nonetheless remaining committed to a path of goodwill and fairness. They lie at the root of our dedication to integrity but do not drive us to use our strength to coerce others into adopting our values. Your inner warrior is one source of strength you can draw upon in times of great need. When you employ your warrior spirit thoughtfully, it manifests itself as clarity, focus, determination, courage, constancy, and an unflappable zest for life. The warrior views roadblocks as evolutionary opportunities and is not afraid to pursue a purpose to its climax. There is more than enough room in the existence of the warrior for softness and benevolence, and the warrior’s willingness to stand up for their beliefs can aid you greatly as you strive to incorporate these ideals into your existence. 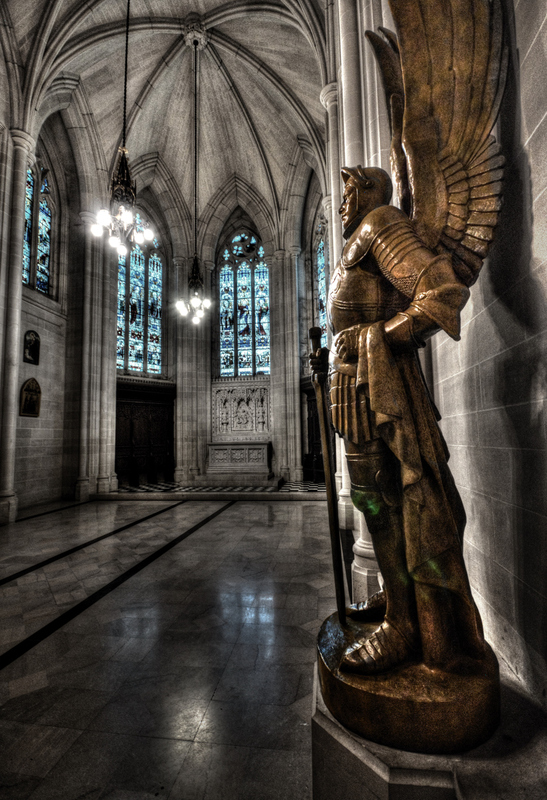 This statue of the Archangel Michael in the Chapel of St. Boniface, taken from this angle has a bit of a Gothic feel to it, somewhat Batmanish arguably. Surprisingly, NYC churches have not issues with photographers carrying tripods, but after our encounters with the “No-Tripod_Police” in Italy, we only packed a small support made by Joby http://joby.com/gorillapod , called a Gorilla Pod. This three armed tripod is a flexible little contraption that allows you to secure your DSLR on top virtually anything – really handy for the travelling shooter. Shooting in RAW (or NEFF with Nikon) format, we were able to make some adjustments for the harsh lighting conditions and uneven White Balance inside this dark/bright alcove in post processing. Shooting RAW allows much greater flexibility compared to JPG, and though one may complain that the files are just too big, memory is cheap…going back and reshooting, not so cheap!